WASHINGTON, Oct 24 2013 (IPS) - Even as Pakistan’s prime minister again publicly demanded an end to controversial U.S. drone strikes in his country before a meeting with U.S. President Barack Obama Wednesday, secret documents reveal long-time collusion with the CIA-led targeted assassination programme. Prime Minister Nawaz Sharif’s visit coincided with fresh allegations this week by human rights groups that U.S. drone strikes in Pakistan’s tribal regions may amount to war crimes. “This whole business of ‘they [Islamabad] secretly or tacitly agreed to the strikes’ is very, very dangerous,” Jeremy Rabkin, a member of the board of directors at the U.S. Institute of Peace, an independent national security institution here, and a professor of law at the George Mason University School of Law, told IPS. “It doesn’t mean very much to us if the Pakistani government can’t even endorse the drone programme in front of their own people,” he said. According to Professor Rabkin, the secret deal between the U.S. and Pakistani governments could pose a serious threat to U.S. interests in the long run. “If you look at the anger of the Pakistani people, it is clear that we’ve acted against their consent, and that doesn’t do us any good. I think we’re on very thin ice,” he said. 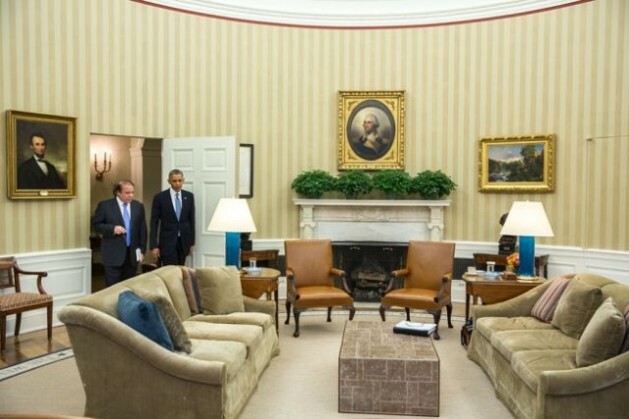 Two days before the Post’s revelations were published, Sharif continued to to press Obama to put a definitive end to drone strikes at an appearance at the U.S. Institute of Peace. However, the evidence suggests that this stance is merely a political maneuver aimed at appeasing Sharif’s audience back home. “What we do know from sources such as Wikileaks is that in the last government at least the prime minister and the president knew about the strikes and supported them,” Christine Fair, an assistant professor at Georgetown University here and a fellow at West Point’s Combating Terrorism Center, said Wednesday. While the Washington Post documents cover the period from 2007 to late 2011, some say that the two countries have shared a covert deal on drone operations ever since the first strike in 2004, which presumably targeted Nek Muhammad Wazir, a greater enemy to Pakistan than he was to the United States as he had twice attempted to assassinate then-President Pervez Musharraf. “The first drone strike in June 2004 was basically the first time the CIA was allowed to use drones. Musharraf had allowed the CIA to carry out these operations. That was the deal from the beginning,” Mark Mazzetti, the national security correspondent for the New York Times said Wednesday. Despite the public outrage over the U.S. drone programme, Afghanistan has been and still is the primary source of tension in U.S.-Pakistan relations, with a looming U.S. withdrawal from Afghanistan set for 2014. However, the relationship between the two countries plunged into crisis in the immediate aftermath of the U.S. raid that captured and killed Osama Bin Laden in northeastern Pakistan in May 2011, which was allegedly conducted without the prior consent of the Pakistani government. The government in Islamabad soon responded by blocking U.S. and NATO access points in and out of Afghanistan, creating a substantial logistical obstacle to U.S. military movements there. The supply routes opened again in July of 2012. The Obama administration has also faced critiques over a U.S. airstrike that killed 24 Pakistani soldiers near the country’s border with Afghanistan. Pakistan has allegedly taken steps of its own aimed at achieving a peaceful solution to the 12-year old conflict in neighboring Afghanistan. Last month, the government in Islamabad agreed to Afghan requests to release long-time leader and founding member of the Afghan Taliban Mullah Abdul Ghani Baradar. Pakistani authorities hoped to finally get the peace process started by having the Taliban negotiate with the Afghan government. According to recent reports, however, Baradar may not be free at all. No negotiations have been set so far, and there have been no talks of setting up a location either. Some suggest that he is still being held captive by Pakistani authorities.